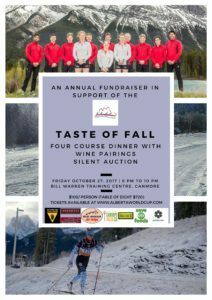 Please join us for our annual Fundraiser Dinner, where our athletes will be serving you a four-course meal with wine pairing. Come and bid on our extensive offering of Silent Auction items and support our athletes in their pursuit of becoming Olympians. This is sure to be a fun filled evening! Seating will be done in tables of 8, feel free to email cjeffries@albertaworldcup.com or nrichard@albertaworldcup.com to confirm tables.